The e-book describes the state of UI technology with an emphasis on new CSS3 properties. It will be useful as an everyday assistant for dealing with CSS properties in practice. It is intended mainly for beginners and intermediate developers. Experienced developers will appreciate a detailed description of Flexbox or introductory summary of the principles of UI development for current web sites and apps. To absorb the information easier, the text is full of images, screenshots and explanatory schemes. Theory is one thing but what about practice? The e-book also deals with common problems. Important features include examples that you can try live at Codepen.io. Flexbox a new layout system, really deserves special attention. In "CSS Mine", we dig deep into the Flexbox problem and include many practical examples. The e-book is also available online. You can start reading here. Martin Michalek is a freelance front-end designer based in Prague, the Czech Republic. He is well-known Czech author and gives lectures about CSS3, responsive design and modern web UI development. 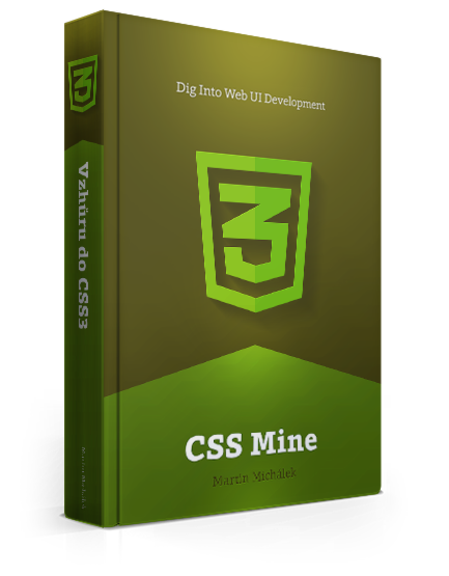 The basis of this e-book lies in several years of writing a CSS3 guide at Vzhuru dolu – a Czech version of CSS Mine.